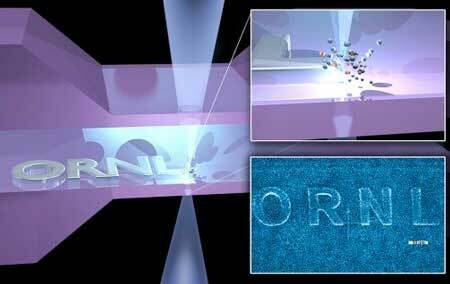 (Nanowerk News) For the first time, a team demonstrated a technique that creates tiny, precise metallic shapes. They rastered a beam from a helium-ion microscope through a liquid precursor to induce chemical reactions. The reactions locally deposit high purity platinum. In spelling out the acronym of their national laboratory, they formed a ribbon only 15 nanometers in diameter—narrower than a cold virus (Nanoscale, "Building with ions: Towards direct write of platinum nanostructures using in situ liquid cell helium ion microscopy"). Direct ion beam writing opens nanofabrication opportunities to improve electronics, drug delivery, catalysis, chemical separations, and other applications. Oak Ridge National Laboratory (ORNL) researchers at the Center for Nanophase Materials Sciences rastered a highly focused helium-ion beam through a thin layer of precursor solution, causing site-specific platinum deposition in a controlled manner. This direct-write technique enabled nanofabrication of high-purity metallic ribbons only 15 nanometers wide—narrower than a cold virus. This work was the first demonstration of direct-write nanofabrication using an ion-beam microscope to direct chemical reactions in a liquid cell, or environmental chamber encapsulating a sample in liquid. It would not have been possible to directly write these highly precise, high-purity metallic structures without a full understanding from experiment and theory. Calculations on ORNL’s Titan supercomputer and analysis of data from experiment and simulation allowed researchers to understand the dynamic interactions between ions, solids, and liquids that were essential for optimizing the process. For example, the scientists analyzed data about nanoparticle nucleation and growth acquired from movies of these processes obtained from the microscope and correlated the results with comprehensive quantum dynamical simulations. Notably, direct writing with a contained liquid precursor, subjected to an ion beam that directed chemical reactions, allowed fabrication of purer nanostructures than would be possible using gas-phase deposition.